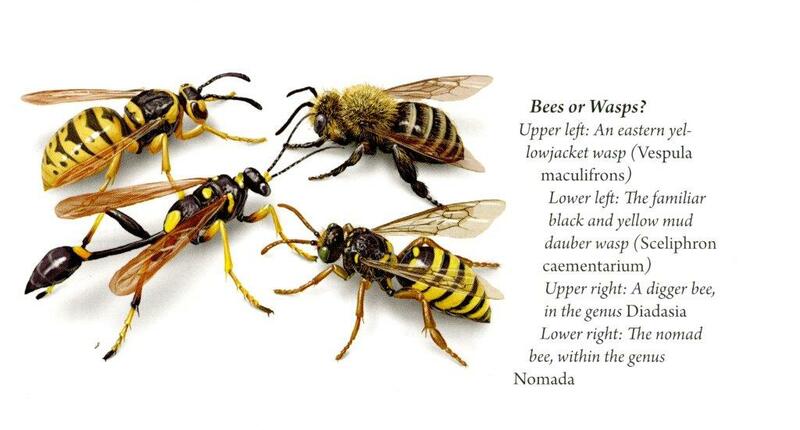 A sobering sentence straight out of Bee Basics: An Introduction to Our Native Bees, a joint publication from the U.S. Department of Agriculture (USDA) Forest Service and the Pollinator Partnership. Authors Beatriz Moisset, Ph.D. and Stephen Buchmann, Ph.D. provide a concise primer on the fundamentals and cyclical heritage of our ‘varied and valuable’ native bees. You may know that bees are sociable, resourceful, and resilient. But did you know that some species are downright parasitically opportunistic? The cuckoo bee is a member of the exclusively parasitic Apidae family. Once it scouts out a potential host site, it furtively waits out of view until the nest is vacated. Then, in a one-two-punch move, the cuckoo bee takes up residence and its young eventually shovel down up any pollen, nectar, and larva in sight. Can you identify a bee from a wasp? Excerpt from publication. Click image to enlarge. The publication also details the homemaker behaviors of bees. The metallic-colored sweat bee is the consummate DIY designer. Nesting itself in the underside of freely-available detritus tree bark, it uses a saliva-pollen amalgam to lovingly tile the interior of its egg chambers. Some domesticating mother bees though the use of mass provisioning—storing up enough food in their brood cell nursery to sustain each larvae for the entirety of their development. New moms, take note! Bee Basics is a great compliment to citizen science efforts to enrich and sustain a pollinator-friendly ecosystem. It concludes with a ecological call to action. The list of worrisome environmental realities are extensive: honey bee die-offs, shrinking native ranges, pesticide use, fungal infestations, and more. Protecting the ecosystem well-being of these minuscule pollinators requires a concerted conservation effort and a respect for the priceless services they provide. Bees have more than paid their dues to this planet. And for that, we are indebted. This entry was posted on Thursday, October 8th, 2015 at 11:25 am and is filed under Agriculture, Department of Agriculture, Environment, Teachers and teaching. You can follow any responses to this entry through the RSS 2.0 feed. You can leave a response, or trackback from your own site.